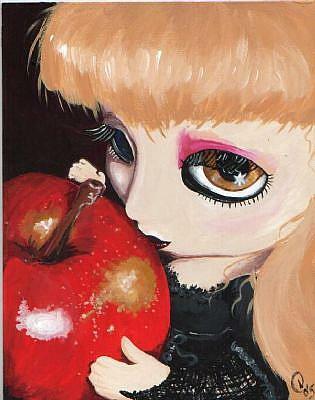 This is my RIP of Noelle Hunt's Poison Apple. Her peice shows the apple getting ready to be bit into but as of yet no bite. I decided to show what happens right after that bite. 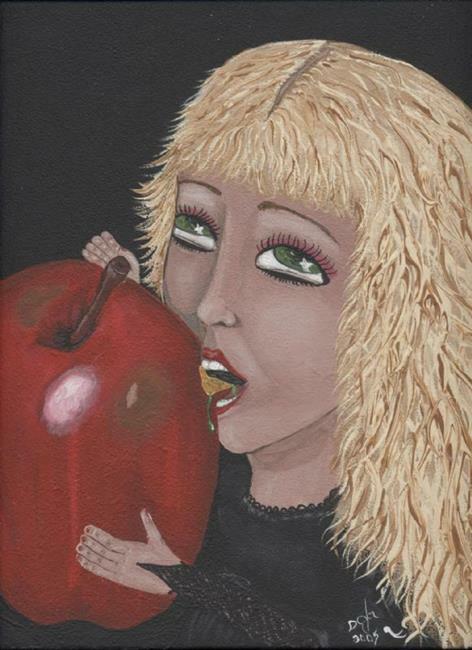 The very first time I saw her Poison Apple I was envisioning that little doll taking a bite. I also loved the detail on her black dress and actually stayed as true to the dress as possible. It is really hard to take a peice that stands on it's own so well and tweak it in such a way as not to destroy the original intent of the peice but superimpose your own style and vision to it. The RIP show is such a fun show in our year, it makes it possible to stretch as an artist, and to be able to play in someone's portfolio. You really couldn't ask for a more fun time! !